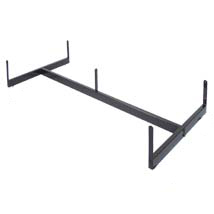 The Gondola Base can be used with 24 in. grid or slatgrid panels for constructing the perfect display.The 48 in. gondola uses 4- 24 in. panels. The Gondola Base is available in Chrome, White and Black. The 48 in gondola comes with levelers.